Our CT & Western Mass Wedding DJ Svc. is more than the Music! We are the Entertainment! That's our philosophy, and we approach each Wedding & Event with the same enthusiasm and detail to assure your function will be fun-filled with lasting memories. Our Wedding DJ's in Western Mass. specialize in wedding reception entertainment and master of ceremony services. This combination of specialties will allow for a polished mix of music while customizing and coordinating all activities. Whether you're seeking a Wedding DJ who is high-energy, low-key, or somewhere in between, we are a company dedicated to the success of your Event. 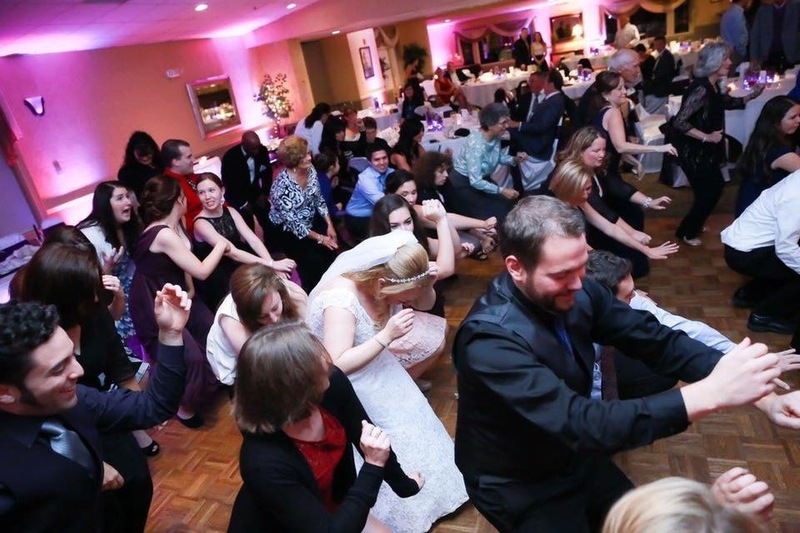 TC's Disc Jockey Service has been providing Western MASS & CT with Wedding DJ & Event entertainment for over 19 years and has the experience & knowledge to ensure your wedding or event is a complete success! "TC’s Disc Jockey Service offered an unparalleled level of service and attentiveness that is hard to find and unmatched in today’s world. From the initial booking to the wedding, TC made everything a breeze. His wedding planner was straight forward and easy to use and if any questions did come up he was quick to respond. I have nothing but good things to say about Tony and his business. During the planning process he was always available and during the wedding he was fantastic. He helped coordinate the day and was laid back and fun. He played everything we had requested, had fun wedding games that incorporated guests and made sure things went as smooth as possible. I didn’t worry about the entertainment because I knew he had everything under control. TC’s is a master of his craft and I have nothing but good things to say about him and his business. If I ever need a DJ in the future I wouldn’t hesitate to hire him again because I know I’d be hiring the best. Five stars simply isn’t enough!" "I honestly wish I could give 100 stars! Tony was so professional yet completely down to earth and fun to work with. His experience just speaks for itself. His website is unbelievable and so easy to navigate to make your playlist exactly what you want. We met with him both in person and over the phone and each time he really helped map out what the night would look like. He really listens and give suggestions when asked. He lets you take control but will still make sure everything works out perfectly the whole night. He even gave me little cues during the reception when I needed to be ready for certain dances, and was great about letting me know what time it was or when I needed to go around to tables to greet guests. He offered suggestions when designing the processionals, and even gave me tricks on how to use your time efficiently throughout the night. Tony will listen to exactly what you want the night to be like. My main concern was the DJ not stealing the show and he was exactly what we were looking for. He is fun and entertaining yet won't be over the top and steal all the attention from the couple. You will not be disappointed!!" "DJ Dave did an excellent job at our wedding. He arrived promptly, met with me with any questions, and made a last minute change in music with ease. Our friends and family greatly enjoyed the mix of music selection. The photo booth was also a huge hit. We would recommend TC's to anyone looking for DJ services." "All in all it was a fantastic event and great service! I think everyone had a great time and I really appreciated Tony keeping eeverything on schedule. I didn't have to worry about a thing and he checked in with us on everything. When the day gets crazy, it's nice to know you have a vendor team that will be there to support you." Thank you so much for everything! The whole night flowed naturally and everyone had a great time dancing and listening to the music. "Tony did such an amazing job as the DJ for our wedding. He was so helpful and calm throughout the entire planning process and even brought up a few things that we would have forgotten to do on our own. Tony helped us with music for the ceremony, mics, music for cocktail hour, and the reception. He seamlessly switched from one place to the next and helped to keep us all on schedule during the reception. He went above and beyond what we expected from a DJ and his prices are so reasonable. He also played great music, really listed to what we said we liked and expanded on the songs we had chosen for the reception in a way that showed he understood our preferences. I highly recommend him to other couples; you'll be very happy with his services." "Thank you for making our special day even better! Everyone had a fantastic time and the music was right on point with what we requested!" "We had Tony as our DJ for our wedding Saturday 5/12/18. He was extremely kind, professional and dependable for all of our needs. He responded quickly to all of my questions no matter the time of day and he was very reliable. His website is very easy to navigate, after we completed our song list he emailed us the entire wedding day timeline, which he also sent to our other vendors (so helpful) On our wedding day he also served as our day of coordinator, reminding us if we were running behind, etc., throughout all the chaos he remained calm and it was very appreciated. I would absolutely recommend Tony and TC Disc Jockey to family and friends- Thank you so much for helping make our day so special!" "We had DJ Bob for our wedding this past Saturday May 5, 2018. We loved him from the minute we met him! His enthusiasm and energy are contagious, and his passion for music is apparent as soon as you start to talk. When we started looking for a DJ, we knew we wanted someone who could really get the party started but was also professional and experienced with weddings. Bob is the total package! He works with you to customize your wedding to exactly what you want and makes the whole process so simple. He had all of our guests on the dance floor the entire night! Our guests loved him and haven’t stopped raving about him. Thank you for making our wedding the most amazing night of our lives!" "LOOK NO FURTHER,Tony is your man!!!! TC's DJ service was absolutely amazing!! From our initial meeting to the absolute end of our big day, Tony was very professional, knowledgeable, informative, artistic and helpful with every last decision and detail. Being my husband's and I first and only wedding, Tony provided us with so much information & options coupled with great ideas, it was very apparent that he had a lot of experience and good business practices as well as ethics. Tony previously worked with the photographer we hired which again proves to his experience and only served to make our big day go even smoother. His DJ wedding structure is very sound. He kept our celebration at a great tempo all night, both in keeping things rolling and butts on the dance floor! He made sure all the highlights of the night were on time and we never felt rushed. Tony has a great personality and sense of humor which made the hiring process as well as our wedding day a delight. Tony was also accessible the whole night and very accommodating to us & our guests. In summation, if you want great value, someone with experience and professionalism that shines through, a man that loves what he does and wants to help your dream day become a reality, then Tony and TC's disc jockey service is who you want!! Couldn't have been happier!!" "Tony and DJ Dave were very helpful in guiding us through how to plan the flow of our special day, and provided in-person, email, and online guidance leading up to the wedding. We were clueless walking in to our consultation, and we left understanding what we needed to do in the planning process. On the day of the event, DJ Dave was there early to get set up, and was able to navigate through that process with little to no guidance from my wedding party. He was positive and professional throughout, and honestly, made this bride feel extremely at ease. Dave is a really nice guy, and kept everything positive and upbeat without being cheesy at all. He was able to keep our wedding party and our schedule on track, and help us to direct our guests. He incorporated all of our MANY musical requests, and transitioned between several different musical styles with ease. He was very attentive to the crowd, and to the wedding party, adapting music and timing effectively. Some of the "first dance" songs we selected were a bit long, and we were able to give Dave a nod when we felt done with dancing to the song, and he transitioned out perfectly. That was a huge relief, as dancing in front of a crowd isn't always the most comfortable moment for everyone. Also, we had brought glow sticks to give out during the dancing portion of the night, forgetting to open and activate all of them. Not only did Dave take care of that for us, but he even recruited our flower girl to hand them out, which was very cute. Most telling, though we had guests that don't like dancing, we got many compliments from those same guests that the music at our wedding was really fun. Those who did love dancing danced the whole time. Our guests really liked Dave, and so did we! We were so glad to have Dave on our special day!" See what hundreds of our clients have to say about TC's Disc Jockey Service. Planning a Wedding or Event in Mass or CT? TC's Disc Jockey Service is fully insured and a proud member of the Association Of Mobile Entertainers. Are you looking for wedding DJ entertainment in Springfield, MA or surrounding areas? Contact our Wedding DJ experts at (888) 617-5530.